Metal Gear Rising: Revengeance star, Raiden has been added to the upcoming multiplayer brawler, SuperSmash PlayStation All-Stars Battle Royale. He’s the latest third-party All-Star to be added to the ranks and it looks like he’s not going to make Sackboy’s life any easier thanks to him packing some deadly blade attacks. I raised some concerns with my Gamescom Hands-On Preview that characters with swords seemed to significantly out-balance everyone else in the game and this video shows Raiden going along with that theory nicely. Hot damn he’s looking pretty badass though. With his Special attacks displaying killer moves like spinning heel blades, a stun attack slice-fest and a merciless charge on competitors trying to hide in cardboard boxes. Other recent inclusions that you may have missed are Nariko (Heavenly Sword), Evil Cole (inFamous) and Sir. Daniel (MediEvil). But will any of them be able to stand up against the seemingly unbeatable Kratos? Four player brawlers are something of a rarity these days, especially if your dusty Nintendo consoles have been boxed up for a while. 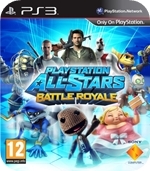 Skirting around the much-mentioned copycat nature of the game, what we have here is an impressive collection of PlayStation’s most iconic first-party characters (and Fat Princess) plus a select few third-party heroes kicking the pixelated hell out of each other. As well as brawling, the game is also something of a platformer as the game is set in 2D levels with players able to leap around platforms and sometimes even bounce off the walls or fall into traps below.